At jnaapti, we have been using containerization technologies since almost the very early days. In 2011, when I was evaluating a solution to provide light-weight containers to our learners in the Virtual Coach, I was told that the only mature solution was to use Virtualization solutions. But Virtualization was too slow (in terms of boot up time) and I didn’t have enough resources to keep stand-by nodes running all the time. So after some evaluation, I decided to use LXC and it served its purpose. However, there were several features missing and I was in the verge of building a few of them myself. So it’s not surprising that when I discovered Docker, I just fell in love with it. One of the first things we did was we moved our LXC based learner containers to Docker. We then slowly started to migrate portions of our infrastructure to Docker. We achieved full Docker migration last November, and then also moved our staging/testing systems in the cloud to Docker. We were already using KVM in our development – so we already had a clear idea about what containers our system should be running. Why the move away from KVM based development environments? Simple! KVM’s disk usage is too much to suit our requirements. We had our development images of 5G each and you have 10’s of such images and are soon out of disk space. I am not sure how many Docker fans will approve some of the things I discuss here but I believe that this is a much leaner solution than using Virtualization and I don’t see any issues in the way I am doing it. Can we use Desktop tools like text-editors with data in Docker? Imagine I am writing a NodeJS application. I want to use Atom installed in my host to write code. However, I want to run NodeJS inside the container. It is very easy to work with command line utilities (which don’t need X) in containers, but how about Desktop utilities like Eclipse? Can we run this in a Docker container and still have the same user experience as a regular app? What are some best practices to do so? The first 2 were rather easy and I sailed through it. The third one, I struggled a little, but I finally made some head-way. This one is easy. A practice we follow is all the code that we write is inside a mounted volume. Containers are used to run processes in a contained fashion, but the processes are manipulating files that are in our host (and not in the underlying diff file system). We can as well remove our containers and we don’t lose anything. This one initially seemed a little difficult, but I figured out soon. 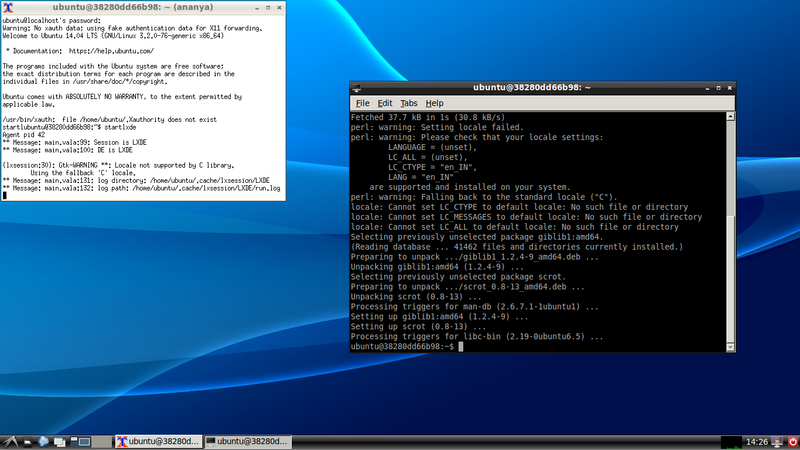 Create an image that has lxde-core package installed in it. You should now see a full fledged Desktop running like this! So your host is running at Ctrl+Alt+F7 and your Docker container is at Ctrl+Alt+F8. Use this option in case you are running many Desktop applications and you want to be totally isolated from the host when working with the applications in the container (i.e you are not using any host applications in conjunction with the applications in the Docker container). I found this option to be better in some ways. I have my Android Studio setup using this option now. A final requirement was whether we can get Docker to detect USB devices. I found that if you pass a –privileged flag and mount the /dev/ device appropriately, you can then access it in the Docker container. I was able to successfully use adb along with my Docker container. Docker has been a boon and although there are several area of improvement, I see that it has a future. 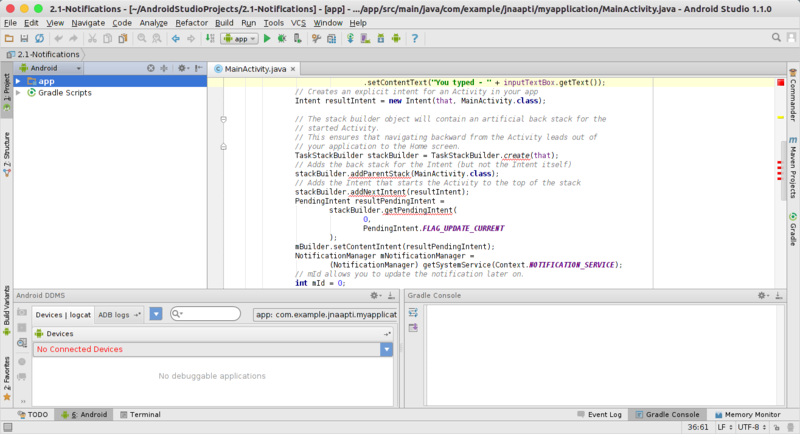 It has become an indispensable tool in our software tools arsenal in jnaapti.